Apple's value fell to $ 812.60 billion below Microsoft, which was valued today at 812.93 billion dollars today. Apple handed the crown as the most valuable company in the world for a few minutes on Monday. 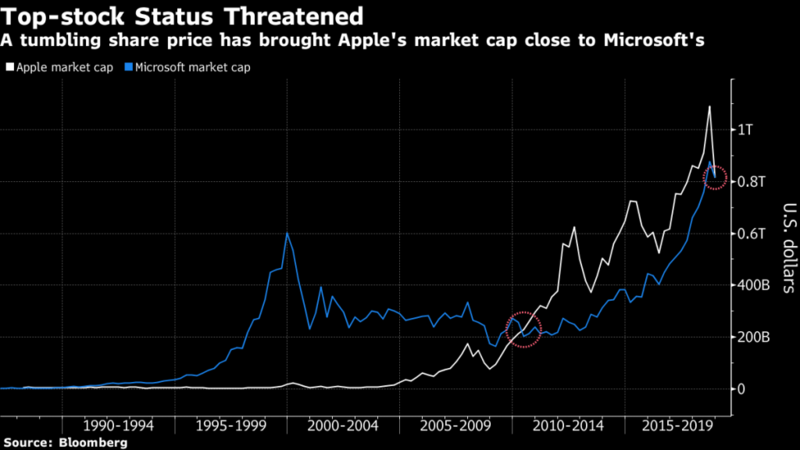 A fall in the shareholder value of iPhone maker in recent weeks has led the company to be overtaken by Microsoft's rivals for the first time in 8 years. The company lost $ 300 billion in value after the $ 1.1 trillion record reached in early October. The last time Microsoft was worth more than Apple was 2010. Apple shares have fallen behind concerns that iPhone sales will be weaker than the company had predicted.